Ely Pina, a Honduran-born waste water treatment specialist at Gildan, was the originator of the idea to apply a biological filtration system to textile manufacturing effluent. Pina studied Hydraulic Engineering in Germany and after some time working in Colombia, she returned to Honduras to work as the Head of the Design Department for the San Pedro Sula city’s water works. It was there that she fell in love with waste water treatment, “I wanted to build systems that take advantage of what the region offers naturally – lots of sun, high temperatures and access to wide-open land,” said Pina. The key to success was finding soil that was impermeable, so that the wastewater could be self-contained in the lagoons. “The land outside our Rio Nance complex in Honduras had all the elements to create the perfect system for naturally-occurring water treatment,” she added. Pina’s goal was to return water to a point where it could sustain and propagate life; “I called it the Biotop, which means ‘pot of life’ in German,” said Pina. In designing the system, one of the biggest challenges was finding the ideal combination and types of bacteria, both aerobic and anaerobic, that would be able to work with the specific effluent coming from textile facilities. “We had to find the specific type of bacteria that could thrive in each stage of the water filtration process,” she added. “I find that the beauty of the system is that it works using nature’s most basic principle of returning elements to their original state,” said Pina. When the wastewater leaves one of Gildan’s textile facilities in Rio Nance, the water is funneled through a series of 41 constructed lagoons and wetlands. The system was engineered so that water continues to flow through to each subsequent lagoon using gravity alone, eliminating the need for any energy to be consumed in the process. 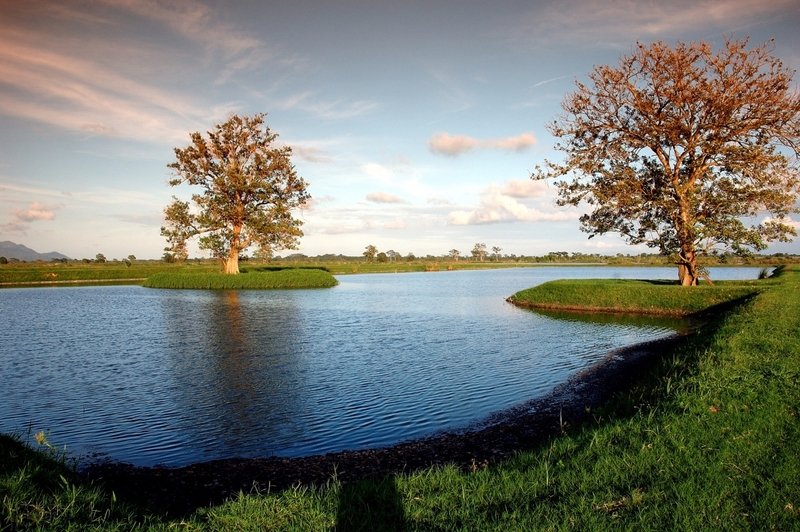 The Biotop system uses a variety of bacteria in the lagoon systems, which progressively remove the dyes and chemicals, until the water becomes fully restored and capable of sustaining life in the last lagoons. While the first few stages of the process include only bacteria and fungi, further along the system you can find higher species such as daphnia which consume the bacteria. In subsequent lagoons there are fish which feed off of the daphnia and species of birds such as cranes, egrets and others that are sustained by the fish. The lagoons are also home to fresh water crocodiles, although they are not natives to the valley where Gildan facilities are located. In 1998, Hurricane Mitch swept through Central America and displaced several fresh water crocodiles into the valley where Gildan built its complex. Three years later, when Pina began designing the systems, she saw the crocodiles and recognized that she needed to accommodate them into her plans. “There were probably 6 or 7 living here at the time we started, Carlitos was the first. He is now 20 years old and measures almost 5 meters,” said Pina. “We have given all the crocodile’s names and every year we look forward to welcoming their babies,” said Pina. Find out more about sustainable practices at Gildan here.